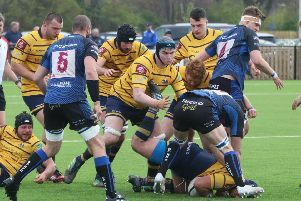 WORTHING Raiders Rugby Club produced a fantastic performance to end Henley Hawks’ winning start to the National 2 South season this afternoon. The visitors had won all 14 of their matches heading into the game but Raiders, who started the day sixth with seven wins and seven losses from their 14 games, led 22-0 at half-time. Matt McLean gave Worthing the lead with a penalty on two minutes, before they touched down their first try on 11 minutes. Kieran Leeming brilliantly kicked the ball over the Henley defence for Finlay Coxon-Smith to touch down but McLean was off target with the conversion. Calum Waters burst down the left to touch down Raiders’ second try on 17 minutes and McLean’s conversion gave the hosts a 15-0 lead. Waters took a quick tap penalty to dive over for Worthing’s third try on 34 minutes and McLean added the extras. Henley put Worthing under the pressure as the half drew to a close but Raiders stood firm to keep the visitors out. Henley made a bright start to the second half and Raiders had Coxon-Smith yellow carded on 42 minutes. Despite a man disadvantage, Raiders extended their lead on 51 minutes through another penalty from McLean. Worthing sealed the four-try bonus point on 57 minutes when Sam Hewick and Alex Nielsen combined to release McLean, who touched down in the corner to make it 30-0. Henley’s James Comben skipped through the Worthing defence to touch down on 61 minutes and he then converted his own try but Raiders stood firm to ensure they ended the visitors’ unbeaten start to the season. Full match report, reaction and pictures in the December 18 edition of the Worthing Herald.